In this article, the Tufts University historian David Ekbladh recalls the intellectual and institution-building work of a pre-Cold War professor of international relations, Edward Mead Earle (1894-1954). Earle was one among many progressive (in his case a self-identified “new historian”) critics of American imperialism in the 1920s who revised their views and in some cases political allegiances in response to the challenge of “totalitarianism.” Ekbladh’s next book studies the interwar origins and dissemination of ideas in support of “a new American globalism” after World War II. The conceit of this essential, stand-alone piece on Earle is that he matters more than current practitioners know to the “birth” of the field of “security studies,” one strand of this new muscular globalism (or, better, interventionism). Security studies wasn’t a response to the Cold War, as virtually every insider account of its evolution insists, but rather to “the unraveling of international order” ten years earlier, and Earle was “[t]he central figure in its rise” (108, emphasis mine). Ekbladh identifies him as a “prophet” for having written a grant application in 1939 calling for “a historical and critical grand strategy for the United States” (119), although others were also busy at the time writing books of this type, and Earle never actually delivered on the promise. A new origin story is usually a sign of contemporary ferment in some part of the academy rather than a matter of simply correcting the historical record. Sure enough, the one that begins with Earle appears to end with the multimillion dollar-endowed Program in Grand Strategy at Yale, established in 2007, associated most prominently with the historian John Lewis Gaddis, one of Earle’s admirers. Like most origin stories, a lot has to be forgotten to make it work. Ekbladh concentrates almost all his attention on it, and as a result we learn very little about Earle’s interpretative advances, findings, and discoveries, or lack thereof, or how others engaged this late, putatively seminal work, let alone how we might think critically about it today. Ekbladh does a great job in reconstructing the two phases in Earle’s early scholarly and later intellectual-entrepreneurial career. Earle taught in the history department at Columbia, beginning as a lecturer in 1921, then as assistant professor after completing his dissertation under Carlton J. H. Hayes in 1923. Macmillan published his Turkey, the Great Powers, and the Baghdad Railway: A Study in Modern Imperialism the same year, and Earle won the American Historical Association’s new George Louis Beer Prize for it. It was also the first and last monograph he would write. He was promoted to associate professor in 1926, and he remained at Columbia until 1934, when he joined the School of Historical Studies at the Institute of Advanced Study in Princeton. Earle would have identified himself professionally in the 1920s as a historian who specialized in the international relations of the Near East. A decade later he would say “a specialist in military affairs and American foreign relations.” He published primarily in Columbia’s in-house political science journals, Political Science Quarterly and Proceedings of the Academy of Political Science of the City of New York, the University of Pennsylvania- based Annals of the American Academy of Political and Social Science, and Foreign Affairs. He did some great work on the neo-mercantilist strategies of rival imperial powers, including the U.S. He also served between 1924-1927 on the board (and in 1926-1927 as vice chairman) of New York’s Foreign Policy Association, then a national, progressive, mass-member alternative to the Council on Foreign Relations. Earle ran its new research department part-time for a year until the FPA lured another young and even more prolific professor of international relations and critic of imperialism, Raymond Leslie Buell, from Harvard in 1927, who built it into the most productive center for the study of U.S. foreign relations in the interwar era. Earle identified himself politically in those years as a “disillusioned Wilsonian” and a one-time supporter of Eugene Debs. In 1928, however, he reluctantly cast his vote for Democrat Al Smith to try and stop the “policy of swagger” represented by Herbert Hoover (“one of the advance agents of that economic imperialism which is one of the principal causes of the war system”). He had also contracted tuberculosis, which ultimately forced him to retire from teaching. Earle wrote a short preface to the novelist and feminist Halibe Edib Adivar’s Turkey Faces the West in 1930 but published no new scholarly study for years after. In 1938 Abraham Flexner, the head of the Institute of Advanced Study, would disparage the stalled career of a once promising historian (115). The whirlwind that comprised Earle’s second, stunning act, described by Ekbladh in the best part of “Present at the Creation,” is thus all the more remarkable. He raised funds primarily from the Carnegie Corporation of New York (with smaller sums for a short while from the Rockefeller Foundation) for his research, a major conference on North Atlantic relations in 1941 (which he was too ill to attend), and most significant, a weekly seminar on military policy he led at the Institute of Advanced Study from 1939 to 1954. He also began to publish again, reworking the grant proposals for numerous short pieces in PSQ, the Annals, and Yale Quarterly, and reworking parts of the articles for his first book in almost two decades, the 73-page Against This Torrent (1941). Two years later he and others in the IAS seminar joined forces to produce Makers of Modern Strategy (1943), Earle’s best known book, an edited volume (“with the collaboration” of then-Princeton assistant professor Gordon Craig and Felix Gilbert, Earle’s assistant at the Institute and later member of the faculty there). Earle wrote three of the twenty substantive chapters on various strategists and schools of strategic thought from Machiavelli to Hitler. Finally, although Ekbladh doesn’t discuss it, Earle also sought to rescue geopolitik from its association with the Nazis and its denunciation by American scholars as a ‘pseudoscience.’ Thus, he persuaded the publishers of British geographer Harold Mackinder’s 1919 Democratic Ideals and Reality to reprint the book that was said to have most influenced Hitler’s geographer Karl Haushofer. Earle wrote an introduction to the new 1942 edition. The wartime publishing projects competed with his extensive government work for Earle’s time. As Ekbladh recounts, in 1941 and 1942 Earle assisted William Donovan in the organizing of the research and analysis division of the Office of Strategic Services, and he made a month-long tour of both old and new (“destroyers for bases”) U.S. facilities in the Caribbean on behalf of the Office of Naval Intelligence. The next year he began advising the commander of the Army Air Forces in the strategic bombing campaign against Germany, traveling to Europe twice on the AAF’s behalf. He received the US Presidential Medal of Merit and the French Legion of Honor for this work (133). Ekbladh interprets this activity idiosyncratically. It is not Earle but “the seminar” that “goes to Washington” in fulfillment of some putative original vision (132). Yes, a few who rotated through the weekly, two-hour seminar in those years also enlisted, accepted consultancies and commissions, and the like. Others among them did not. Most important, however, is the fact that dozens if not hundreds of scholars inside and outside international relations did so without a seminar to spur them to join the battle. The argument for a collective ethos in this case is unconvincing. What the war work may well help explain, however, is why Earle never did deliver a substantial piece of scholarship on military affairs or grand strategy of his own. Earle offered up two new ideas and repurposed an old one in the late 1930s and early 1940s publications. The first is his identification of a real failing in American political science, which had never taken up the study of military and defense policy in any systematic way. Colleges and universities did not teach the subject. The professors lacked the expertise to contribute to “intelligent and practicable foreign policies” at a time when, Earle fretted, the U.S. lacked any coherent policy of national defense. As Ekbladh reports, the Carnegie Foundation in 1937 also dismissed Earle’s proposal to begin to rectify this failing as tantamount to propaganda. If it were truly necessary, then it ought to be paid for by the government rather than by a private foundation. This tension “at the creation” between the work Earle was proposing and the norm of disinterested scientific inquiry is not discussed by Ekbladh although it was a continuing problem for foundations, universities, and faculty. When Carnegie agreed to fund Earle’s project two years later, the grant could not be run through the Institute of Advanced Study, since the work was patently not the kind of basic research that its members were expected to pursue. The same issue of basic research versus emergency war work sparked the closing down of the Social Science Research Council’s International Relations Committee when Earle resigned as its chair in 1941. A. Whitney Griswold of Yale’s Institute for International Studies, the most outspoken of the SSRC committee members in his concern for the costs to the university’s mission of the anything-but-disinterested-turn in IR research that Earle was advocating, shut down the YIIS on these grounds when he took over the presidency of Yale in 1951. Keep in mind, too, that Earle never actually provided a way forward by producing a major work of scholarship or propaganda of his own on the military or on civilian-military affairs. It took another twelve or more years and the founding of the SSRC’s Committee on Civil-Military Relations Research in 1952. The committee chair, Columbia’s William T. R. (“Bill”) Fox, expanded the research agenda in the renamed Committee on National Security Policy Research two years later. That committee supported the project that would become Harvard Ph.D. and new assistant professor Samuel Huntington’s first book, Soldier and the State (1957). Note that the name change seems to fit the insiders’ (conventional) story that Ekbladh thinks is wrong about the Cold War origins of the subfield. Ekbladh also views Fox as one of the two thinkers along with Bernard Brodie whose scholarship and career trajectories demonstrate the singular influence of Earle and his seminar, although Fox himself viewed matters differently, as we will soon see. Earle’s second idea is sandwiched between the first and third essays in his terse Against This Torrent, a brief for joining the war on the side of Great Britain. The first discussed the threat posed by the totalitarian states, including the Soviet Union, which dated the book almost immediately. The southern political scientist Arthur Dugan criticized his reliance on such “facile classification.” The third essay argued why intervention in the war was in the U.S. national interest, as every other brief for joining the war so argued. The second, 25-page essay, though, prepares the ground for the interventionist case by showing that such U.S. grand strategists as Washington, Hamilton, Madison, Jay, and later Woodrow Wilson all understood the importance of the balance of power in Europe to U.S. security. Thus the latter led the U.S. to war only “incidentally” to make the world safe for democracy but more fundamentally to keep Europe divided. Earle here anticipates a characteristic of professors of international relations who write a kind of over-simple historical narrative to fit the theory (one that admits to no interpretative ambiguity). Nonetheless no later student of the historical origins of U.S. national security policy begins with the argument in Against This Torrent. The third, most compelling idea—one that was pursued at great length by others in later decades, unfortunately, without reference to Earle—comes in the chapter on “Adam Smith, Alexander Hamilton, Friedrich List: The Economic Foundations of Military Power” in Makers of Modern Strategy. It is the only one of his three chapters retained once others took over the franchise. In it Earle revised his earlier critical view of neo-mercantilism to highlight Hamilton’s influence on List and thus his influential role in promoting manufactures as a mainspring of military security. If ideas provide one rough measure of importance in turn by professors of international relations to writing about the military, power, strategy, and national security the late 1930s and early 1940s, then Ekbladh’s ranking of Earle needs to be rethought. Nothing he wrote matches the ambition (and not least word count!) of Harold and Margaret Sprout’s Rise of American Naval Power (1939) and Toward A New Order of Sea Power (1941), Raymond Leslie Buell’s Isolated America (1940), Bernard Brodie’s Sea Power in the Machine Age (1941), H. A. Sargeaunt and Geoffrey West’s Grand Strategy (1941), Pendleton Herring’s Impact of War (1941), Nicholas Spykman’s American Strategy in World Politics (1942), Hans Weigert’s Generals and Geographers: The Twilight of Geopolitics (1942), Robert Strausz-Hupé’s Geopolitics (1942), Quincy Wright’s monumental two volume (1552 page! ), two-decade-in-the-making Study of War (1942), Walter Lippmann’s U.S. Foreign Policy: Shield of the Republic (1943), or William T. R. Fox’s The Super-Powers (1944). Since Ekbladh tends to treat Earle’s seminar as a kind of crucible keep, in mind too that most of the above named professors didn’t attend it. Harold Sprout did, but he and his wife Margaret wrote the first of their books on sea power before Earle launched the Princeton program in military studies. Brodie revised his Chicago dissertation during his year as a Carnegie fellow at the Institute in 1942-1943, and Earle’s views on building research capacities in military strategy for the long term rather than in times of emergency did indeed matter to Brodie. Ekbladh tends to makes his case for Earle and his seminar’s outsized influence in producing a cadre of like-minded professors by citing the boilerplate that Earle provided his funders rather than testing its claims. (126-127) Passage through the military affairs seminar suffices to establish its long-term effect. So Earle highlights Brodie’s hire at Yale in 1945 (once let go from the position at Dartmouth that Earle helped arrange and joining the Navy) and Fox’s move to Columbia in 1951 to direct its new Center for War and Peace Studies—on the IAS model Ekbladh says—as instances of alumni continuing to “fan out across the country.” (137) Fox had left one temporary position at, as he saw it, lowly Temple for another one at Princeton’s School of International Affairs in 1941, which is when he attended Earle’s seminar. His dissertation advisor at Chicago, Quincy Wright, secured Fox his new tenure track position at Yale’s Institute of International Studies two years later, and Fox in turn brought his fellow Chicago Ph.D. and Wright advisee, Brodie, to Yale in 1945. His 1944 book, The Super-Powers, acknowledges many of his Yale colleagues along with two Princeton professors, David Rowe and Harold Sprout, but not Earle. Fox would later write two essays recalling key influences on his career and on the profession of international relations more generally. His essay on Frederick Dunn, who had succeeded Nicholas Spykman as director of the YIIS in 1940, appeared in World Politics in October 1962. He credits Dunn with the turn to the problem of national security policy and its directed research program during the war and the further turn in the 1950s to model-building (reflecting “the historical discontinuities of the thermonuclear era”) once the YIIS, most of its affiliated faculty, and its journal, World Politics, relocated to Princeton. Fox’s second essay on Chicago’s senior professor of IR, Quincy Wright (hired in 1923 as a full professor when he was 32 years old), appeared in 1970. Earle gets a footnote when Fox turns to analyzing Wright’s “remarkable” A Study of War. Wright “thought, researched, and wrote in the service of no national government.” In contrast, the precursors “of the multitudinous post-World War II strategic studies” were found elsewhere. These two essays offer correctives to Ekbladh’s too enthusiastic championing of Earle as the “lost founder” (112) of a field, a “prophet,” the creator of the “basic approaches and institutional supports…still common in the world of security studies” (108) and so forth. Fox, for one, does not appear to be quite the acolyte that Ekbladh imagines. More important, Earle and his seminar appear to be less significant than Ekbladh describes when measured against the work of the YIIS under Dunn. This is true in terms of funds raised, projects completed, publications produced, and, to use a measure that Ekbladh favors, “alumni” flow. Brodie migrated from Yale to Rand, Fox from Yale to direct the Institute of War and Peace Studies at Columbia. Others in the Yale group went on to build the Foreign Policy Institute at the Johns Hopkins School of Advanced International Study (Arnold Wolfers), and the Center for International Studies at MIT (Max Millikan, Walt Rostow, Lucian Pye). Ekbladh notes the irony in Earle’s failure to create a lasting institutional presence at the Institute of Advanced Study (138). No doubt. Meanwhile the transplanted Yale Institute for International Studies exists to this day, less than two miles away. Since Ekbladh is unclear about this, it is important to stress that Earle, the leadership of the YIIS, and the latest generation of young social scientists eager to demonstrate the practical consequences of their expertise in the war and first post-war years all spoke in terms of building the enterprise of “international relations,” which was still at an “early stage of development” (or so they claimed) as the lead article in the premier 1948 issue of Yale’s new journal World Politics put it. No one was then talking about “strategic studies,” let alone “security studies,” despite Ekbladh’s constant reference to the latter. They talked about founding a professional society of their own, reopening an old debate on IR’s status as a distinct “branch of knowledge” (that is, a “discipline”) and launching a new one about the kind of theory that was possible and desirable to pursue. In a review prepared for the Social Science Research Council in 1948, “Interwar International Relations Research: The American Experience,” Bill Fox singled out Earle along with Dunn, Wright, Spykman, and Arnold Wolfers, among others, for their “rediscovery of national security problems.” And Earle joined both the founding editorial board of World Politics and the newly constituted if short-lived SSRC Committee on International Relations Research under the chairmanship of Dunn, with Fox as its secretary. The reality is, however, that as his health deteriorated, Earle’s involvement waned. Ekbladh concludes that the “apparent disjuncture from the past brought by the atomic bomb and the intensification of the Cold War conspired to hide Earle’s influence,” (138) but that argument needs some rethinking too. Dartmouth political scientist Gene Lyons published the first postwar stocktaking and canon-building assessment of the new growth field of “national security research” in 1963 in the Journal of Politics, just as IR theorists then liked to imagine, a newly identified tight bipolar system was experiencing some slack. The real disjuncture apparently is that once the war ended in 1945 the academy resisted more than embraced strategic studies, at least for a time. Universities only seriously began offering courses in national security in the 1960s, apparently. Lyons argues that for the first postwar decade, scholars devoted much more attention to international organizations and area studies than to national security. The Yale group, which carried on its research and publishing on national security into the postwar era, was the main exception.. Nonetheless, he discusses the work of scholars such as Chicago’s Harold Lasswell and Quincy Wright in the 1930s and Earle’s important contribution to the study of military affairs through the seminar and the publishing of Makers of Modern Strategy. In place of Ekbladh’s story about the forces that conspired to obscure Earle’s influence, I want to offer up a simpler or, as political scientists say, more ‘parsimonious’ theory. The footnotes to Earle disappear because he didn’t really matter to the two strands of early, classified Rand- and later Policy Institute-propelled work that Lyons, Fox, and so forth identify with the creation of the strategic studies field in the late 1950s and early 1960s. Consider the counterfactual. Imagine that “Ed” Earle remained, as his contemporary Raymond Leslie Buell described him, one of the isolationists, part of the Nation and New Republic “crowd,” who didn’t flip-flop in the 1930s. What would the consequences have been for the institutions and practices that came to compose Cold War-era strategic studies, for which professors readily identified multiple “precursors” in the 1930s and 1940, and for today’s self-identified grand strategists? Briefly, the political scientists who no longer use it much and the historians who apparently do would have had to make their way without a textbook, Makers of Grand Strategy, which, as of the 1986 edition, no longer lists Earle as the author. Earle “mattered” about as much as the Cold War political scientists thought at the time and as Inderjeet Parmar, who worked in his papers, confirmed a decade ago. He was one of about a dozen scholars (together with the journalist Walter Lippmann) in the mid-to-late 1930s and beyond associated with what Fox in 1949 called the rise of the “new realism” in international relations, before realism gained the kind of reductive definition that leads Ekbladh to question its application in Earle’s case (136). Earle, though, wrote and lectured primarily as an advocate for U.S. entry into the war, whether in Political Science Quarterly or in Ladies Home Journal. It is where one finds, for example, his expansive definition of the “military boundaries” beyond those of a nation’s territory. Ekbladh, however,doesn’t try to determine Earle’s influence on later U.S. official thinking about “forward defense” and the like. Earle’s lack of detachment, his declining output after the war, and the absence of a sustained work of scholarship by him that others could wrestle with go far in explaining his shorter rather than longer half-life on the reading lists and comprehensive exams. Robert Vitalis (Ph.D. MIT) teaches political science at the University of Pennsylvania. The working title of his next book is “The End of Empire in American International Relations.” He is the author of When Capitalists Collide: Business Conflict and the End of Empire in Egypt (1995) and American’s Kingdom: Mythmaking on the Saudi Oil Frontier (2006). Author’s Note: For help, article scans on demand, pointed conversations, and email exchanges, I offer my thanks to Tarek Barkawi, David Ekbladh, Avery Goldstein, David Grondin, Bruce Kuklick, Inderjeet Parmar, Brian Schmidt, Peter Trubowitz, and Stephen Wertheim. Some of Ekbladh’s discussion is “prefigured” (as those in the 1960s and 1970s said about Earle’s work in relation to the burgeoning field of strategic studies) in Inderjeet Parmar, “Edward Earle and the Rise of Realism in the United States Academy,” Manchester Papers in Politics, No. 3/01, Department of Government, University of Manchester, 2001. See most recently Jim Sleeper, “Grand Strategic Failure,” Foreign Policy August 13, 2010, and Thomas Meaney and Stephen Wertheim, “Grand Flattery,” The Nation, May 28, 2012, 27-31. 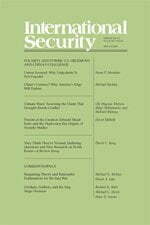 For one, as University of Ottawa’s David Grondin reminded me, “security studies” itself is an identification that only emerged once the Cold War ended, as a challenge to the earlier era’s “strategic studies.” Ekbladh’s anachronistic use of the term is surprising, coming from an intellectual historian rather than an insider. For another, in contrast to Ekbladh’s big tent view of security studies the reality is more like separate worlds, one of which is inhabited almost exclusively by political scientists and governed by those whose dream is of a field growing ever “more rigorous, methodologically sophisticated, and theoretically inclined.” See Steven Walt, “The Renaissance of Security Studies,” International Studies Quarterly 35, 2 (June 1991), 211-239: 211-212. The other is inhabited mainly by historians of statecraft left stranded after the cultural studies turn in diplomatic history and hostile to the kind of theory that political scientists produce. The summary here, however, also draws from my own research and adds some details not found in Ekbladh’s account. Folder [unnumbered] Biographical/Rdg. Lists, Biographical Material, 1941-1954, Box 1, Edward Mead Earle Papers, Seeley G. Mudd Manuscript Library, Princeton University, Princeton, New Jersey. Correspondence, “The Issue is Tolerance,” Edward Mead Earle to the Editor, The Nation, September 26, 1928, 28-29. The exceptions are a piece in 1934 and then more short pieces in 1937 in the The New Republic where he published much more regularly in the 1920s on Near Eastern questions and the international politics of oil. For its first years see “The Princeton Program in Military Studies,” Military Affairs 6, 1 (1942), 21-26. See Earle to Henry Holt and Co, March 16, 1942, Folder, Writings, Books-Democratic Ideals & Reality [1 of 2] 1937-1942, Box 36, Earle Papers. Institute for Advanced Study, Bulletin No. 12, 1945-1946 (Princeton, NJ: IAS, October 1946), 9. The Bulletin reports that Earle was commissioned to write a history of the bombardment effort. Ekbladh does not discuss it, and I have not seen reference to such a work elsewhere. Earle did write an article, “The Influence of Air Power on History,” published in the Yale Review, June 1946, which was reprinted in Directorate of Command and Staff Training, Air Ministry, London, American Views on Air Power: Two Papers by General Carl Spaatz and Edward Mead Earle, Pamphlet 238 (November 1947). Barry Katz, Foreign Intelligence: Research and Analysis in the Office of Strategic Services, 1942-1945 (Cambridge: Harvard University Press, 1989). EME, “Military Policy and National Security,” PSQ, 53, 1 (1938), 1-13, “National Defense and Political Science,” PSQ 55, 4 (1940), 481-495, and “the Princeton Program in Military Studies,” Military Affairs 6, 1 (1942), 21-26. Nor did the foundation officers want to run the risk of “offending the soul of good old Andrew and the peace of mind of his widow,” so the funds were specified for “studies on foreign policy.” Earle nonetheless used the cash to run his seminar on the American military. See Conversation between Edward Mead Earle and John Dollard and Frederick Keppel, Notes by W[illiam] W L[ockwood], 1/29/41, marked confidential, Box 4, Folder ACIS-Correspondence, Rockefeller foundation [2 of 2] 1939-1941, Earle Papers. For Griswold, see Bruce Kuklick, “The Rise of Policy Institutes in the United States, 1943-1971,” Orbis 55, 11 (Fall 2011), 685-699: 690-691. For Earle and the SSRC committee see Robert Vitalis, “From International Relations—Back When International Relations Meant Race Relations—to Area Studies,” unpublished paper, April 2012. See William T. R. Fox, “Civil-Military Relations Research: The SSRC Committee and its Research Survey,” World Politics 6, 2 (1954), 278-288. Members included McGeorge Bundy, Gordon Craig (Earle’s collaborator), John Miller, Harold Stein, and the SSRC staffer Bryce Wood. Arthur B Dugan, “Needed: A New Balance of Power” (review of Earle’s Against this Torrent), Sewanee Review 50, 1 (1942), 124-127: 127. One of the only recent studies I know to reference Earle’s Against This Torrent misses a key part of the argument. Charles Kupchan and Peter Trubowitz, “Dead Center: The Demise of Liberal Internationalism in the United States,” International Security 32, 2 (2007), 7-44, write (15) that Earle was one of the leading strategic thinkers to conclude “that distance was no longer a reliable guarantee of the nation’s security.” What Earle argued however is that “geography alone does not now provide, and never of itself has provided, sufficient guarantee of American security. Our invulnerability heretofore has been based upon the interaction of geography and the balance of power in Europe and the Far East” (40, emphasis mine). See Western Reserve University historian Henry Bourne’s surprised reaction to Earle’s inclusion of Hamilton in his account of doctrines of economic nationalism in his review, Journal of Modern History 16, 1 (1944), 60-61. See the discussion in Fred Kaplan, Wizards of Armageddon (Stanford: 1991 ), 16-17. William T. R. Fox, “Frederick Sherwood Dunn and the American Study of International Relations,” World Politics 15, 1 (1962), 1-19, and reprinted in Fox, The American Study of International Relations (Columbia, SC: University of South Carolina Press, 1968), 36-56. The best account of the YIIS is by Paul Ramos, “The Role of the Yale Institute of International Studies in the Construction of the United States National Security Ideology, 1935-1951,” Ph.D. Dissertation, Department of Government, University of Manchester, 2003, which is my source for my discussion below. William T. R. Fox, ““The Truth Shall Make You Free”: One Student’s Appreciation of Quincy Wright, Journal of Conflict Resolution 14, 4 (1970), 449-452. For the best account to date of this key juncture see Nicolas Guilhot, ed., The Invention of International Relations Theory: Realism, the Rockefeller Foundation, and the 1954 Conference on Theory (New York: Columbia University Press, 2011). The paper for the conference was published in World Politics 2, 1 (1949) and reprinted in Fox, American Study of International Relations, 1-13. See document titled Proposals for a SSRC Committee on International Relations, Folder 2283, IR, 1948-1950, SSRC Records, Rockefeller Archive Center, Tarrytown, NY. William Wohlforth, “Unipolar Stability: The Rules of Power Analysis,” Harvard International Review, 29, 1 (Spring 2007), 42-46. Almost thirty years later, William Olson and John (A. J. R.) Groom made the same general argument about Earle’s foreshadowing of strategic studies. International Relations Then and Now (London: Routledge, 1991), 99. Earle’s erasure isn’t as complete as Ekbladh imagines. Raymond Leslie Buell to Joseph Chamberlain [chair of the executive committee of the Foreign Policy Association] April 2, 1939, Box 3, Folder 16, Raymond Leslie Buell Papers, LOC. For the main exception in the political science field, see Ken Booth’s decades-old critical assessment of the book’s influence, “American Strategy: The Myths Revisited,” in Ken Booth and Moorhead Wright, eds., American Thinking About War and Peace (Brighton: Harvester Press, 1978), 4. Edward Mead Earle, “Political and Military Strategy for the United States,” Proceedings of the Academy of Political Science, 19, 2 (1941), 2-9. University of Texas at Austin’s Peter Trubowitz argues (in an email to author, May 5, 2012) for an affinity between the ideas of Earle, Spykman, and the even better known geographer Isaiah Bowman and the policies pursued by Cold War era policymakers.